an ever-changing selection of our work. Our family has a heritage of woodworking here at Rockledge Farm. Four generations ago we operated a mail order business from the Farm, selling among other products produced, wood furniture. Today Rockledge Farm Woodworks is a small family operated business, in the beautiful valley formed by the North Branch of the Black River in Southeastern Vermont. Visit our 200 year old hill farm, where we create custom designed, one of a kind furniture and woodenware. 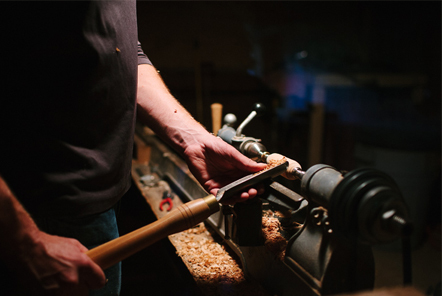 In our Workshop / Gallery meet our family craftsmen and watch them demonstrate woodworking in beautiful Burls and Figured Hardwoods. Learn of the long tradition of forestry and wood products in Vermont. Shop for gifts and furniture in our gallery barn, or discuss your custom furniture project with us. Bring a picnic lunch and enjoy it on one of the tables in the old lane under the heirloom apple trees. Conveniently located on State Highway 106 a picturesque 15-20 minute drive from the villages of Woodstock, Ludlow or Springfield VT, or Exit 8 of Interstate 91, we look forward to having you visit. We're open Monday thru Saturday 9-5, Sunday 12-4, or by appointment.